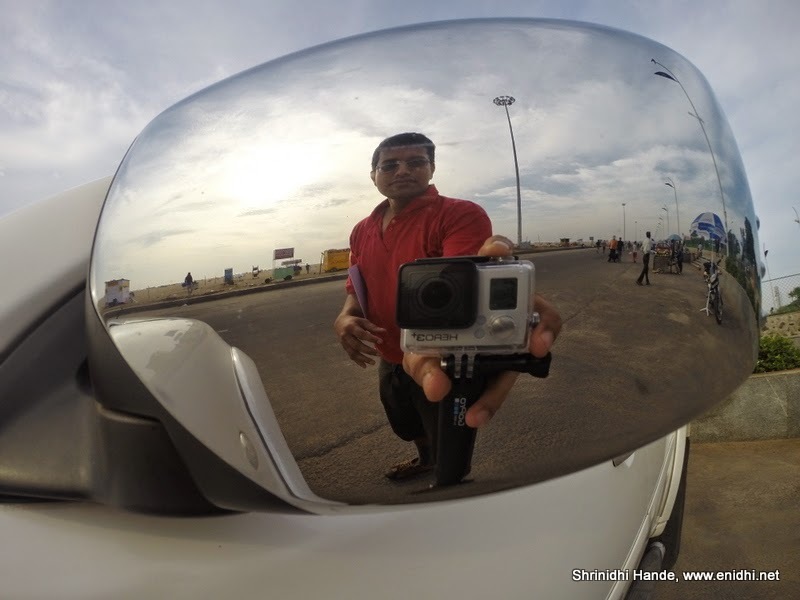 Having spent 4 consecutive weekends at home, this morning we went out to Marina beach in Chennai. I spotted a Pajero sport on display, with a sticker "Ask for a test drive." I did and rest is history! When I approached the person in charge for test drive, I wasn't very sure. Some of these premium car salesmen over time have developed a knack to weed out those who can't afford to buy a 30 lakh car. By looking at you they figure out if they should spend time explaining the car to you or you're not worth it. But this Pajero sport salesman readily agreed when I asked for a test drive. Without any formalities, I was behind the wheels and we set off. We went for a short ride and during which we were driving next to the ocean for a while- I asked the salesman if I can drive on the sand. Without slightest hesitation he agreed. I changed to 4x4 and drove on the sand. It was a supershort drive, but it was fun. Back on the main road, we came back to where we started, but on the way policemen stopped us, saying it is one way and we should take a detour. I happily reversed and we hit the main road again. But now, half of the road from Gandhi statue till Anna memorial was blocked for traffic, because of a marathon. We couldn't go to the beach side, so had to take a really long detour-to Broadway, Central, Secretariat, Anna Salai, Express Avenue, Cathedral road, R K Salai and eventually back to Gandhi statue at Marina, all in all logging over 30-35kms. Though that is very short drive to pass judgment on the car, it helped me understand Pajero sport much better. 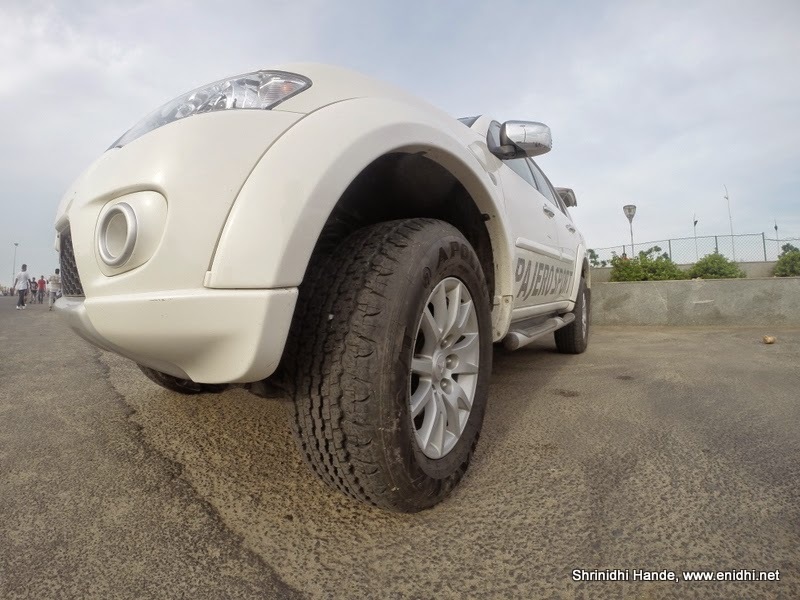 I haven't driven the Fortuner 4x4 (have only driven 4x2), hence am unable to pass a verdict which one is better. But during my drive I couldn't really find anything to complain about. Pajero pulls ahead very easily, responded to steering brilliantly and was always game for some action. The anniversary edition that I drove is actually 1 year old.This new Pajero was launched in 2012 and sometime in June 2013, Anniversary edition was launched with some extra goodies. 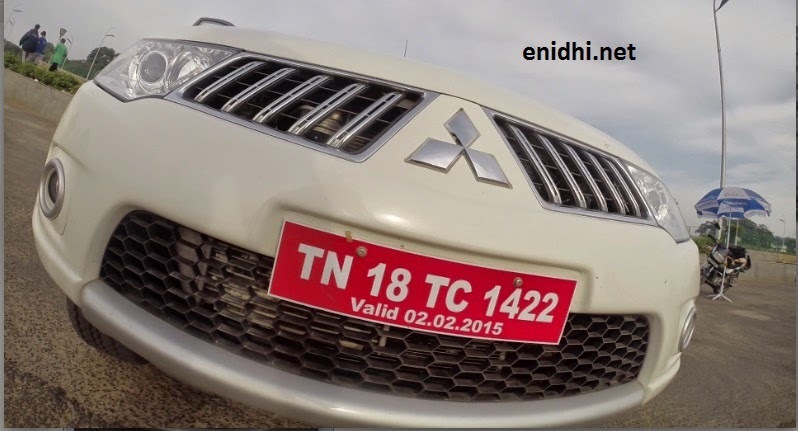 Unfortunately Mitsubishi's pool sales and service network hasn't helped this good product win customer confidence. 5. Bigger than Pajero by a few mms. 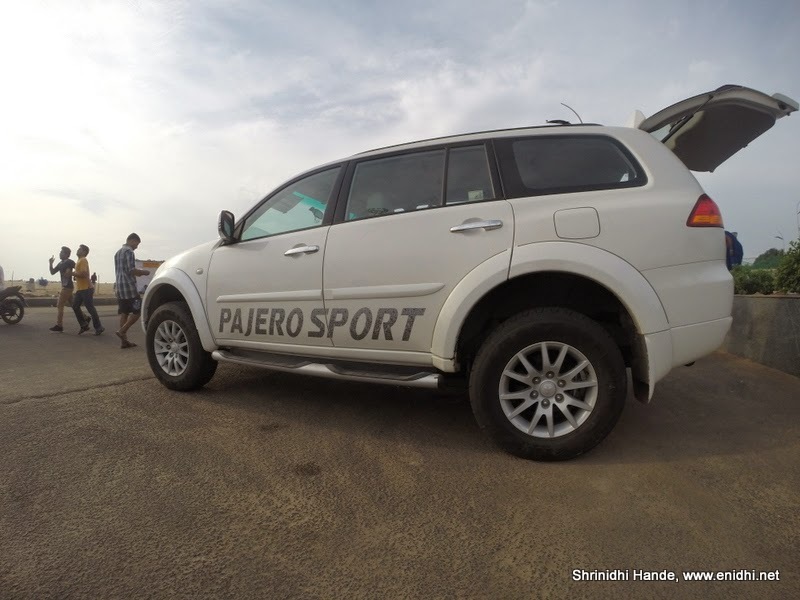 I also learnt from the sales guy about "Heart in Mouth" events- which is similar to Mahindra Great Escape- an offroad event for the owners of Pajeros. Also Mitsubishi has stopped all other cars in India- Lancer, Evo, Montero, Outlander etc and is currently selling only Pajero. Next few years they plan to come up with a small car (probably Mirage? ), sedan and other models. End of the drive, I wasn't asked the usual "Sir, when are you planning to buy?" question. I guess he made out that I can't afford this kind of car. I made a short video of the Pajero drive. Watch it below. Pajero sports retails at 28.4 lakhs in Chennai. Fortuner, Ford Endeavor, Isuzu MU-7, Rexton-7 etc compete with Pajero in the premium SUV market. Nice review and supporting photographs ! Prasad- just walk into nearby showroom! will they give it for an experiential drive... ? I only met a regular salesman and he might not have the authority to give it to you for a weekend.